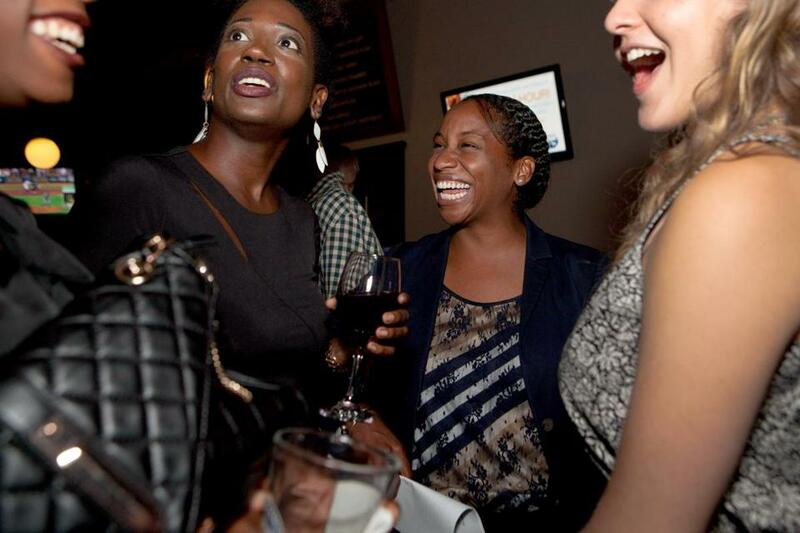 Andrea Campbell (second from right) and supporters celebrated her success in last week’s City Council primary. Andrea Campbell always thought she and her late twin brother, Andre, shared the same life story. It was a tough story. They lost both parents at a young age and spent time in the foster care system. Even as their paths diverged — as she moved through Boston Latin School, Princeton, and UCLA Law School, and he went to alternative schools and the criminal justice system — they still came from the same place. And while that is still true, she said, becoming a candidate for Boston City Council has forced her for the first time to more deeply ponder who makes it out of difficult circumstances, and who doesn’t. Campbell, 33, is a first-time candidate in District 4 . In last Tuesday’s preliminary election, she trounced incumbent Charles C. Yancey , carrying 25 of 32 precincts. Yancey was first elected in 1983, the first year of district representation , and is the only person to represent the district. My guess is, that’s about to change. Campbell’s campaign has been driven by a ton of hard work, great connections — she served in the legal office of Governor Deval Patrick — and a willingness to listen closely to constituents as they laid out the many issues confronting the district. It includes Mattapan, and parts of Dorchester, Jamaica Plain and Roslindale. Her brother died at 29, while in state custody awaiting trial on home invasion and other charges. Several years earlier, Campbell says, he had been diagnosed with an autoimmune disease called scleroderma, and his health declined precipitously over two years in custody, despite her fevered advocacy for more attentive care. She says she can now see that they were treated differently in school, even before she tested into Latin. When they were at the Blackstone Elementary School, they were split up, the better to develop their own identities. But Andre got labeled a behavioral problem, while Andrea flourished. “Personally we were going through similar things, but when we left our home, we were going to different places,” Campbell said. “Sometimes I would go to programs that were just for girls, or I had different mentors.” She became a Girl Scout and went on college tours. He went to the Jeremiah E. Burke High School, which for a time wasn’t even accredited. After his arrest, her brother would bounce between correctional facilities and the hospitals affiliated with them. Campbell’s voice on the telephone became familiar to correctional officers as she tried to figure out why her brother kept getting sicker, why he had lost 60 pounds, whether he was still getting the medication that had kept him relatively healthy when he was on the street. When the end came, at Tufts Medical Center, she ordered two correctional guards out of his hospital room. “It was clear that the wasn’t going to make it,” she said. And clear that he wasn’t a threat to anyone. In the end, it was a story of once-parallel lives with dramatically different endings, a story many of the district’s voters grasp intuitively, the sometimes-thin line between success and failure. If it holds lessons for public office, Campbell doesn’t claim to fully grasp them.